The Coursera course,”E-learning and Digital Cultures,” starts on January 28, 2013; however, hundreds of people are already actively engaged in “proliferating” the digital cultures and learning in the process. I am a member of a Facebook group dedicated to setting up learning digital groups, exchanging ideas, and enthusiastically anticipating the course beginning. Group members exchange Twitter accounts, set up blogs, and create virtual study groups. Every day I learn about a new social media tool, a new cool website, and a new cool technology tool for sharing information. My head swirls with digits and images. And the course has not yet started! Participants will craft new blogs – each presenting an individual perspective on what is happening in the digital world, each fighting for your attention, and each adding one more bit in the billion of bits of information. 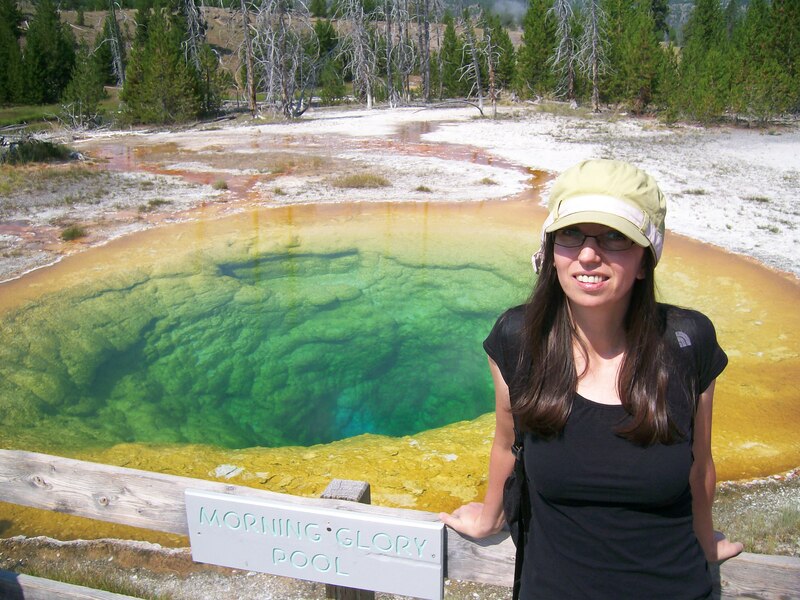 With clean cloths and clean hair, I was in a good mood for our next adventure: the geysers at Yellowstone National Park. More than 300 geysers, all part of a large volcanic system, constantly release pressure in the form of steam, smoke, and bubbly mud. The Green Tortoise bus dropped us a few miles away from the visitor’s center and we resumed a slow stroll along a trail with labeled geysers. Under the scorching heat, we dragged ourselves from one “wonder” geyser to another, seeking protection from hard-to-find trees. 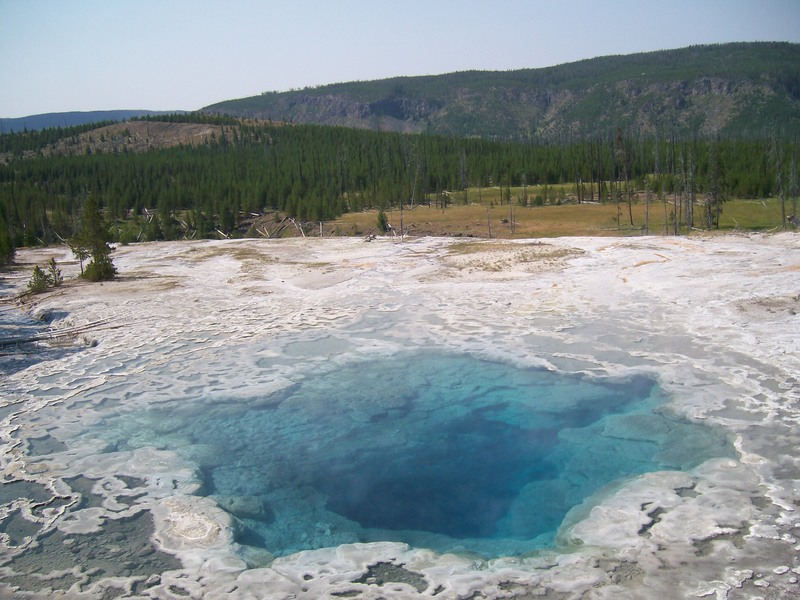 Orange-yellow, egg-shaped geysers replaced baby-blue, eye-shaped ones. From the mineral deposits, some geysers, such as the impressive Castle Geyser, developed tall structures and strange shapes. 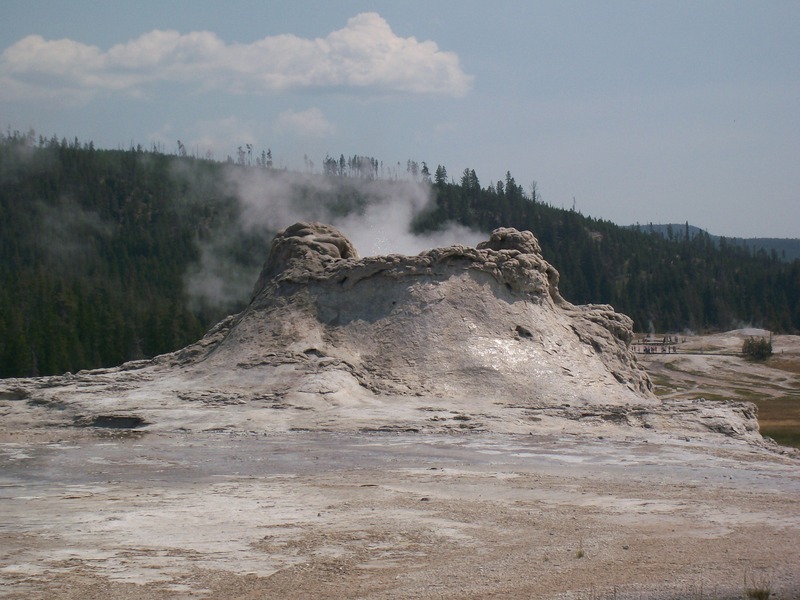 The geysers have distinctive, and often, funny names. My favorite, the Economic Geyser, made me chuckle. I thought, “A great logo for the Great Recession we are currently in.” Others competed for our attention with names like Beauty Pool, Comet Geyser, Infant Geyser, Lion Geyser, etc. Our final destination was the Old Faithful, perhaps, the most famous geyser in North America, called “Faithful” because it erupts predictably every 91 minutes, satisfying the desire of thousands of visitors per year to observe geology in action. As the Old Faithful was about to erupt, a standing crowd of tourists raised their cameras in expectation. The geyser made a few abortive attempts, and then, suddenly, it showed its full glory. We added to the million redundant camera shots of Old Faithful, a proof that we participated in the grand circus of people with technology eager to frieze a fleeting moment for the digital eternity. I learned today that the Yellowstone National Park has its own Grand Canyon, the Grand Canyon of the Yellowstone, not to be confused with the one and only Grand Canyon. As we were talking excitedly about our next destination, our bus suddenly stopped. There were lines of cars in front of us and behind us. It was a herd of bison! Drivers slowed down to take photos of the nearby bison, a few of them shamelessly running along the line of cars or crossing in front of them. 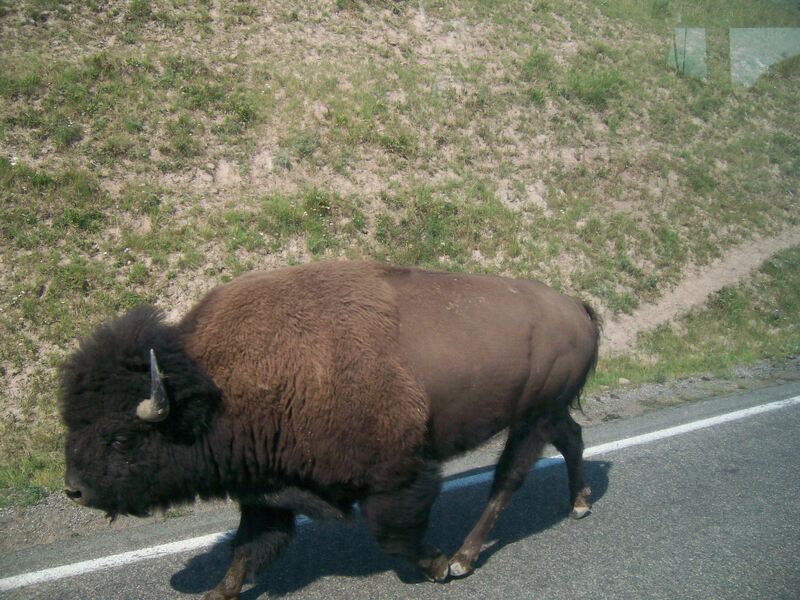 We were shooting pictures from the left, right, and driver’s window, competing for the best shot of bison. 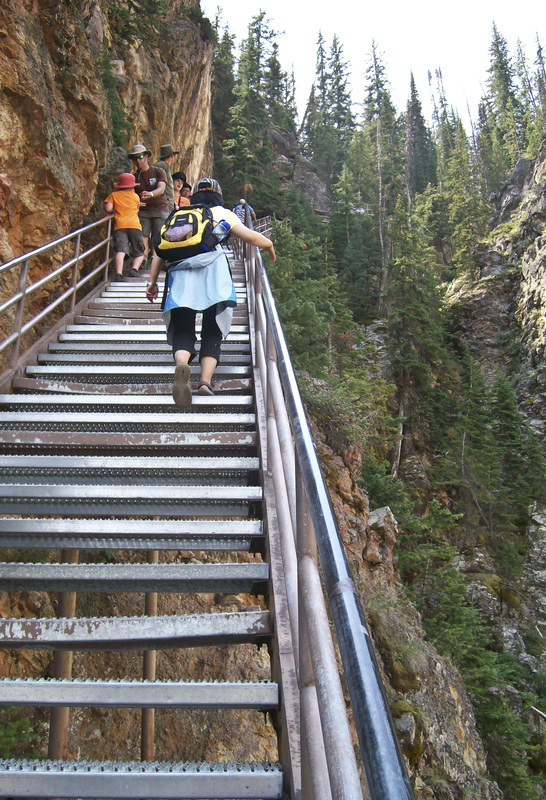 Some of us went down the challenging 300 step-stairs to the waterfall. Steep and dizzy downhill, hard-to-breathe and muscle-cramping climb uphill, it was worth every single step. 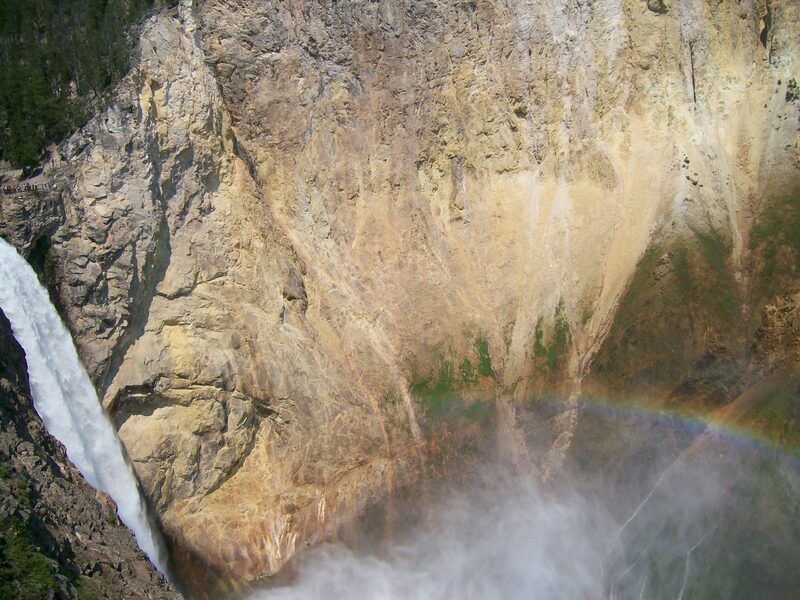 At the end of the stairs, we saw a rainbow caressing the tall roaring waterfall. I was speechless. Later on, a few of us took a trail to a smaller waterfall, then were able to sit closer to it, and even feel the small drops of water on our tired bodies. Immersed in the sound of thundering waterfall, we were just there with no thoughts, no expectation, nothing but presence. Having slept in a tent on a hard surface in the cold Wyoming night, I woke up re-energized and eager for new adventures. Today’s destination was a hike to the Inspiration Point above Jenny Lake at Grand Teton National Park. On the way to our hike, we learned from our French-speaking friends on the bus that Grand Teton, the peak at 3,770 feet (4,197 m) height after which the park was named, means “large breast” in French, a name supposedly coined by French explorers who first spotted the peak. 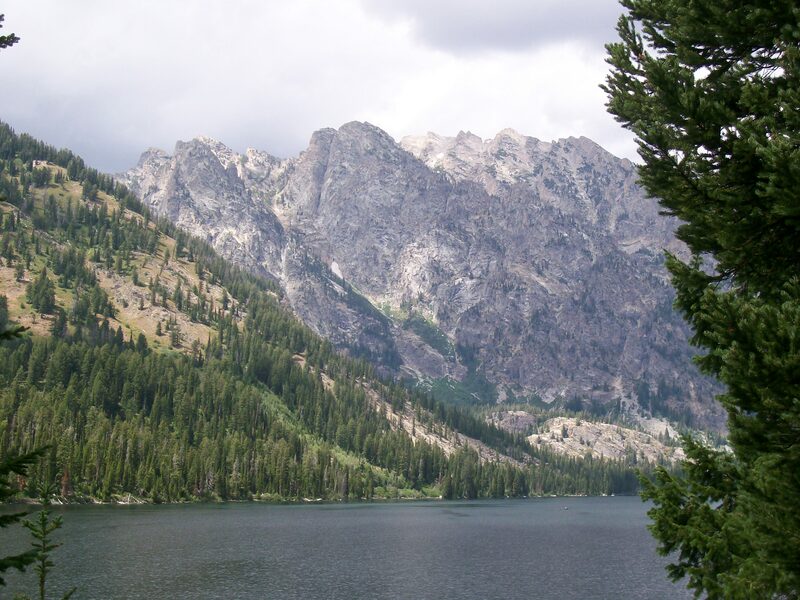 To learn more about the name controversy go to: http://en.wikipedia.org/wiki/Grand_Teton#Name. Crossing the Jenny Lake by boat we looked at the tall snowy peaks hovering above the lake. Few drops of rain splashed on our faces, yet nothing could deter our determination to climb up the hills. The sun peaked through the clouds. The surrounding landscape emanated simultaneously a feeling of coldness and warmth: cold white glaciers touching the endless blue sky, warm green pine trees brushing against the cotton-white clouds. The Inspiration Point, the end point of our hike, allowed for a panoramic view across the Jenny Lake and the various mountain peaks. Hikers took a chance to rest their legs, enjoy the view, and eat their lunch. We had turkey sandwiches and few mandarins to quench our thirst. Dehydration is the worst enemy of hikers so water bottles and juicy fruits are a must on long trails. As we were munching on our sandwiches, the smallest squirrel I had ever seen shamelessly approached us. I thought to myself, “What a perfect toy (or prey) for my cats. 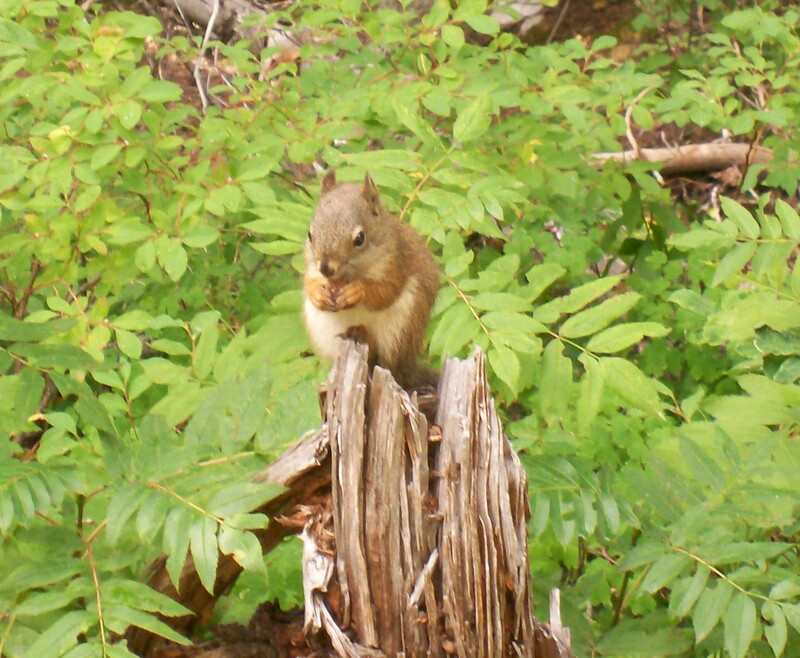 ” I am always astonished at how different squirrels are by shape, size and color in different locations and altitudes. The trail was crowded. People of all nationalities and ages were forming a single line and carefully watching their steps on the stony and, at places, treacherous road. Civilization had encroached on pristine beauty, and I was a part of the problem, eager for personal enrichment. I pondered on the paradox of my, and others, love for untouched-by-human-hand nature and my human desire to be present in it. How could I enjoy nature without impacting it with my human and flawed behavior? On the way back, James and I took the two-mile trail along the lake. It was perhaps my favorite part of the hike. We passed by some astonishing flowers in bright red, yellow, white and blue colors and looked at the crystal clear water of the lake. As we were going downhill, the vegetation around us changed from pine trees to trees with larger-surface leaves. Showers are a luxury on campgrounds and we had the privilege to use some for two days at our campsite in Grand Teton National Park. I had just finished showering, a complex process involving accounting for all the small bits and pieces a human needs to feel comfort- a shampoo, hair conditioner, soap, comb, clean clothes (which can be hard to find after several days of hiking and no access to a laundry machine), water-proof shoes, hair-drier (No! I did not bring one but I rented one at the camp site.) and many others. Carrying all that in a backpack to a shower and back is a part of the camp experience. I was on my way back to our camp site when, all of sudden, it was pitch dark and there were no people on the road. I turned on my flashlight and looked around. Some signs were pointing to the number of our camp site, but somehow everything looked different. Had that large trailer been over there before? Soon I realized that I had no idea where I was, so I decided to go back to the starting point and find people to direct me. I was lucky to bump into some people of our group and then James found me in the dark and helped me get back to the camp site. Nobody had explained to me that there were separate group and individual sites with the same loop and camp site numbers. For veteran campers that might have been a common knowledge, but it was unknown for a city person like me. There cannot be camping without a camp fire. Gathered around its smoky flames, holding sticks with marshmallows above the fire, singing camp songs under the leadership of Tess, our second driver, we forgot all our worries, our online personalities, our connection with the civilized world. We were hypnotized and purified by the power of camp fire. It was the end of a great day. Loaded like donkeys with two sleeping bags, a tent, clothes for 10 days, and other camping paraphernalia (which mostly James was carrying) we finally managed to get to the departure point at Columbus Ave in San Francisco. I did not know what to expect from this upcoming trip but was excited and at the same time a little bit uneasy. After suffering for three hours in the somewhat unfriendly Bay Area weather, we found ourselves in a long line of heavily- equipped travelers waiting to board a Green Tortoise travel bus. To my surprise, the people joining the adventure were mostly international travelers, and as we found out later, they came from different countries and even continents. We shared a great experience with people from China, Japan, Australia, Switzerland, Netherlands, Poland, Germany, Britain, Russia, Spain, France, Bulgaria (my home country) and the United States. Once on the bus, eager to meet the other fellow travelers, we began talking excitingly with each other. The young Chinese man to my right smiled friendly at me and soon we were talking about Chinese history, the global economy, and our respective cultures. The outgoing Japanese girl to my left told her story of travels, living abroad, and the sometimes not-so-easy experience of belonging to more than one culture. I would later discover that this was the beginning of a new friendship. Soon we were to experience another surprise called the “miracle.” At about 10 p.m. our driver and travel guide Dave asked us to leave everything on the bus but a toothbrush and a pillow. Then, we unloaded all small bags from the bus to leave space for sleeping. We were getting ready to convert the seats into beds. Somehow 34 people with 2 drivers had to fit into a lying position and sleep for the rest of the night while the driver covered endless miles towards our next destination. We woke up in the Ruby Mountains, Nevada. Our luggage laid scattered; people were searching through their bags unsure what to put in and what to take out. We soon learned that we are the ones who would prepare our own meals and clean the mess after that. Our first breakfast was ready. Everyone was required to “wash” their hands in three buckets of water: the first with soap, the second with clean water, and the third with a drop of bleach. After that we patiently waited in line to serve ourselves some delicious food. We had different breakfast every day: sometimes hot cereal with fruit salad and yogurt, other times, French toast and pancakes. Our awesome boss Dave, the driver, had prepared in advance a diverse and healthy menu for the whole trip. 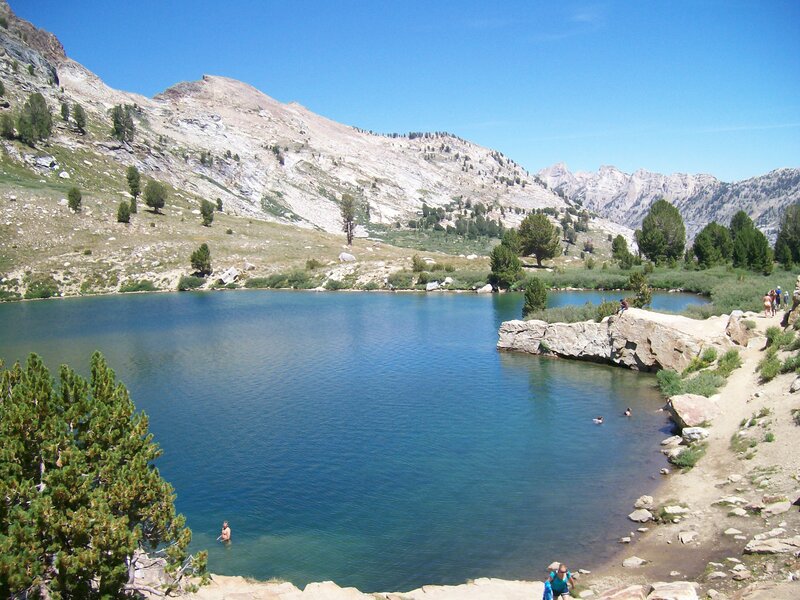 The landscape along our first hike to the Lamoille Lake was somewhat desolate, lined with rocky hills and sparse trees; our final destination- a pristine lake at 9,740 feet (2,969 m) height. Breathing in the rarefied air, bodies out of shape, our hike felt really challenging. Later we realized that this was one of the easiest hikes. 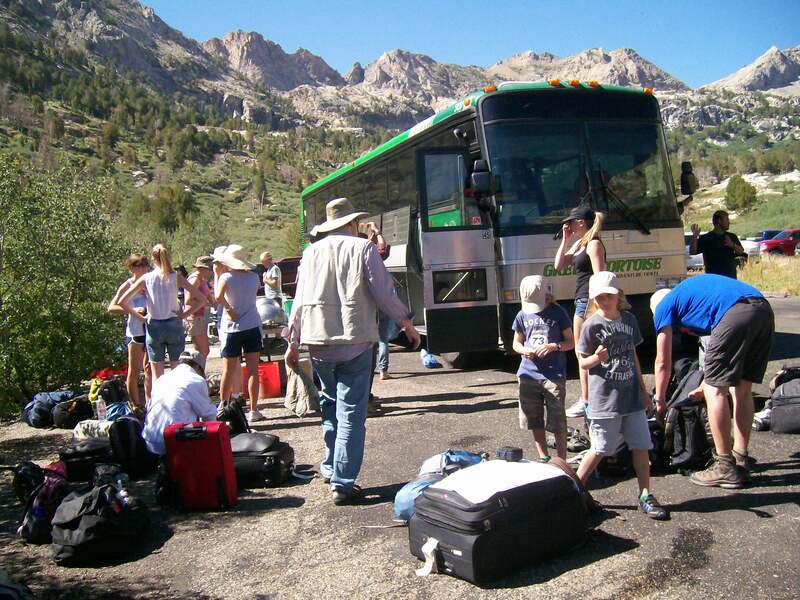 Today we headed towards Jackson Hole, Wyoming, and the main activity on the schedule was white water rafting. James unwillingly agreed to participate and would later discover that he had made the right choice. I was quite excited yet a little bit apprehensive because of memories from a previous quite daring rafting experience. Expecting challenging rafting, I was surprised to find out that the river was mellow and only few of the rapids were a class three. The raft drifted seamlessly down the stream. We floated on a fifteen-people capacity boat and pretended that we were rowing. The boat guide did most of the rowing and gave us commands that we hardly followed because when approaching rapids we were too busy being afraid and screaming to pay attention to the rowing task at hand. James unexpectedly had a lot of fun on the raft and managed not to break his glasses. I was relieved. Some people jumped into the water to cool off. Then, people on the boat had to pull them by their safety jackets. One of the girls had a bleeding nose from the cold and we were all quite worried about her; the bleeding soon stopped. The rafting ended in victory with no boats flipped and no injuries. 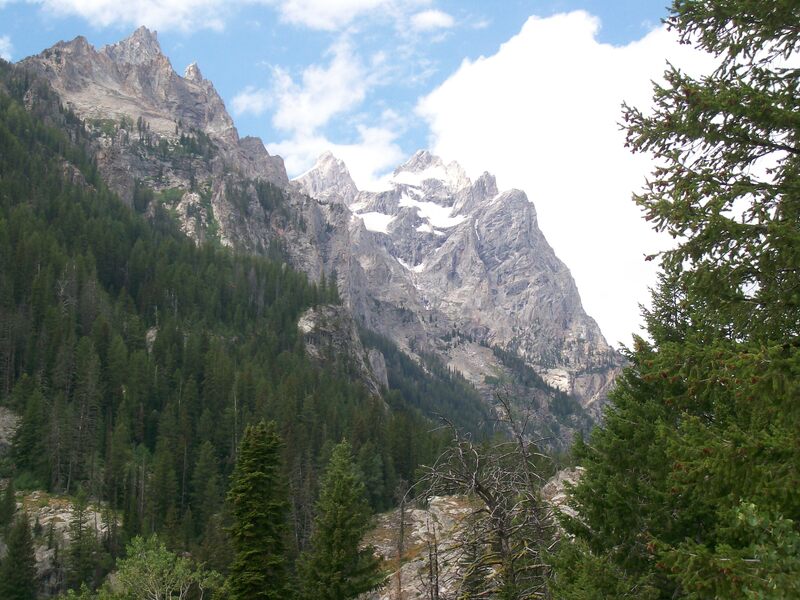 Eventually, we set up our first camp at Grand Teton National Park. We had to work together to arrange dinner tables, cut vegetables, wash dishes, prepare food. Somehow things got done and chaos turned into order and order into chaos. And so the story begins…It is on this hot July evening that I have decided to make my internal dialogue public. I am nervous and, at the same time, excited at the opportunity to share my thoughts with the rest of the world. It is probably the anxiety from the approaching U.S. presidential election, the nasty discourse raging in the virtual world, the negative public reception of the Health Care Reform and the recent Supreme Court’s decision to make it permanent, the apathetic pedestrians on the nearly empty Chico streets, the global warming deniers, the feeling of isolation in an American mid-size city that made me want to start a blog. Whatever the motives I hope this journey would lead me to new discoveries about myself, about society and humanity as a whole. I hope you would share your own thoughts on the subjects that would be discussed here. A new dialogue would then emerge to uplift our spirits.